April is National Child Abuse Prevention Month, a time to recognize that we each can play a part in promoting the social and emotional well-being of children and families in communities. 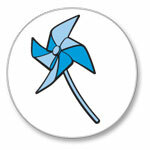 Cruzin Cap's Blue Pinwheel cap is a way to show our support for Child Abuse Prevention. 250 caps per pack.